When it comes to cooking at camp, you either enjoy it or not. For those who would rather spend their time hiking and relaxing, the canned food approach is for you. While there is nothing wrong with this technique there are a few things you can do to improve your meals without taking away from the time outdoors. First, prep, prep, and prep. Yes, I said prep. I know this sounds like homework but let’s face it we do not just go out and camp without prepping. This includes planning on what we are going to where, getting the tent and sleeping bag along with reserving our camping site. Believe it or not, planning for our meals is no different. To save time and money, prepare as many meals at home. This is great for the first few days but it really is not practical for the long term if you are fixing soups and stews. But, having said that, if you are preparing snacks such as granola, go ahead and pack enough for the long haul. Snack foods such as this will keep. When it comes to storing your homemade soups and stews for camp, you have two choices. 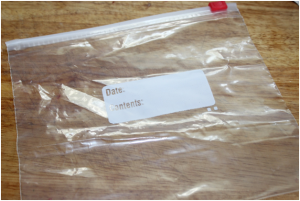 One is a container with a lid or a resealable bag. Either one will work but keep in mind that the resealable bag will take up less space in your cooler. Once you have your food bagged up, throw it in the freezer. Freezing it will allow it to keep longer while providing additional cooling without the ice. Next, premeasured as much as possible and place in a labeled, resealable bag. Do not just put what is in the bag on the label but include the amount and what recipe this ingredient goes with. This is a lesson that I learned the hard way. It is easy to just grab a premeasured bag of flour for say sausage gravy but what do you do when you have a recipe that calls for an exact amount. To prevent this situation, this is why it is so important to take the time and label the bag correctly. The last camp cooking tip is to understand how to cook over a fire. Yes, I know this sound simple but there is a science behind this ancient cooking technique. First, you must understand direct verses indirect cooking methods. If you put the dish in the fire or coals then this is direct heat. On the other hand, if you suspend the dish over the fire then this is indirect. If you are looking to prepare a quick meal, consider using direct heat. A foil packet meal would be an example of this approach. But, if you have more time, plan on cooking a dish using indirect heat. While this method does take longer, it does produce a moister meal. Looking for some ideas for this technique, think about preparing a stew or soup from scratch in a Dutch oven over an open fire. While preparing meals while camping can be a challenge, the tips above will give you a starting point that can turn you from the canned food expert to a camp chef.